This week’s episode of Real Housewives of New York is all about communication, or lack thereof. Everyone is on the outs with Ramona Singer, a.k.a. Eyelander, last living original housewife. She left the Berkshires under the pretense of having a repressed memory episode of hysterics. Instead, she went to a party held by Molly Sims, who hadn’t been mentioned on television this much in years. Ramona is a big fan of communi-hating — it’s like communicating, except you just yell at people and don’t listen to what they have to say. She seems to have a screw loose. Even with the occasional pretense, everyone on New York seems authentic, without pushing for a “storyline.” Instead, they just seems to be acting like themselves. Nothing tops off a night of binge-drinking better than early morning yoga. After drunkenly plotting revenge against Ramona, all the ladies are looking a little rough. Sonja Morgan, a.k.a. In-the-Red Sonja, Warrior of Booze, laughs as she has trouble doing yoga without passing wind. Meanwhile, Kristen Taekman is the only one who is halfway functional. Is it her youth or is her liver the most effective at removing toxins from her body? Carole Radziwill is being photographed for a magazine. She is getting deluxe make-up contouring on her face which is pretty intense for a biological woman. She calls her pal LuAnn “Desperate” Lesseps to join her because she has a piece about manners she hasn’t written. Once again, a cool girl (Carole dated George Clooney) takes advantage of an outcast. Is it okay for a writer to take ideas from a fellow author? Also, she weirdly reads out her own by-line. Meanwhile, didn’t she get miffed when LuAnn asked her friend to borrow a dress? LuAnn and her boyfriend Jacques fix up Carole with actor Nick Gregory. You might remember him from… something? But sadly, Carole acts awkwardly and asks inappropriate questions embarrassing this attractive guy in a TV credit for his reel. She asks his age, tells him she’s going to play matchmaker, and then talks about him like he isn’t there. Heather Thomson masterminds a confrontation with Ramona. This is after taking a second to randomly grab Kristen’s son’s ice cream cone to take a lick. The girls decide to sit in a circular table to keep Ramona from escaping. LuAnn, well versed in Passive Aggressive English, broaches the topic heavy-handedly. Everyone starts yelling at once in a cacophony of wailing. No, they are not trying to lure the Hydra from his lair, they just want Ramona to understand she’s rude. But Ramona has been rewarded for rudeness since her first day on television. In the end, Sonja is making no sense and Carole is making genius barbs under her breath. Kristen and Josh Taekman get into a passive aggressive fight during their daughter Kingsley’s physical therapy. The sad part is that they clearly don’t listen to each other. Their daughter is struggling with an inability to walk and they are fighting in front of the woman trying to help her. Little do they know, their physical therapist had to hug her cat Kitty Ruxpin all night while swearing off all men just to get to sleep. Josh is insensitive by taking calls and emails the whole time. Kristen, meanwhile, is needlessly aggressive in front of a stranger, and all of America. She also doesn’t understand the demands of his job. They need a mediator, stat. Ramona is suddenly repentant about what happened with Kristen… to everyone but Kristen. She has a work out complete with a bottle of wine. Her husband, Mario Singer shows up to discuss the drama. Do they not realize this seems so staged? She invites Kristen to tea to apologize. However, Kristen is justifiably angry. Not pressing charges or fighting back left Kristen with some displaced anger. She’s wants an answer for “Why?” Ramona seems subdued and not as hopped up as she normally is. 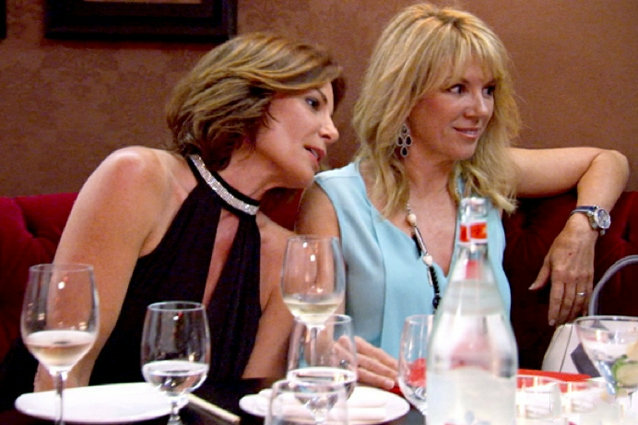 Kristen asks Ramona if it’s an alcohol or anger management issue. These strike a nerve and Ramona tries to make an exit. Then, like no one before her, Kristen points out how crazy Ramona acts and how she’s always in a rush. “I chose to sit to the right of Ramona because I’m like a linebacker from the 49ers. There was no way she was getting up.” – LuAnn about her size?